Down Goes Brown is a blog dedicated to making fun of the NHL. The site launched in 2008. In addition to this site, I wrote for Grantland.com for three years; I'm currently writing for various sites and publications. 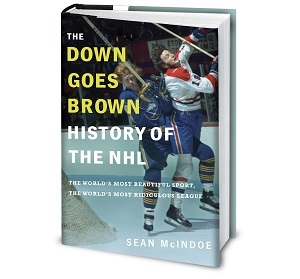 Down Goes Brown is written by Sean McIndoe. I'm an Ottawa-based writer and web marketer. Before I sold out to the corporate world I got a degree in journalism and worked as a reporter. I'm a diehard Leafs fan. You can also follow me on Twitter, like me on Facebook, and watch old Leafs highlights I've uploaded to Youtube. Where did the name of the site come from? It came from Joe Bowen's call of this 1992 fight between Rob Brown and Sylvain Lefebvre. The site averages a little over 1 million visits per year, which is about 999,000 more than I ever had any right to expect. Pretty much of all that comes from people who've spread the word to friends, coworkers, hockey sites and forums. You people are awesome, and I owe you all a beer. Seriously, print this page out and give it to the bartender the next time you go drinking. He'll know what to do. Can I copy something I read here to another site? Everything I write is copyrighted, but I don't mind if you spread it around as long as a.) you mention where you found it, b.) you include a link back if possible, and c.) you don't edit out my logo or URL from any images I've made. Other than that, feel free to share the content anywhere you think people will like it. … the Brian Burke twitter account? – Background and full archive of tweets are here. … “Dammit, Pronger”? – That started in the suspension flowchart. Now he just shows up randomly to injure people. Just like in real life. … all the love for Chris Durno? – See this post, halfway down. Are any of these questions actually "frequently asked" or is this just a clichéd device you're using because you feel uncomfortable writing about yourself? Shut up.